DUBLIN BUS WORKERS are seeking pay increases of up to 30% over a number of years to bring them in line with Luas staff. The National Bus and Rail Union (NBRU) will bring the pay claim to the Labour Court on Thursday. Speaking to the TheJournal.ie ahead of the appearance, general secretary of the NBRU Dermot O’Leary said that bus workers were seeking pay parity with tram workers. O’Leary said that a recent dispute between Luas workers and the operating company Transdev had lifted a “veil of secrecy” that surrounded their pay and conditions. “The very public dispute between Luas workers and Transdev showed us what money they’re on,” said O’Leary. Earlier this month, Luas workers voted to accept pay recommendations from the Labour Court – bringing to an end a protracted and heated dispute that had seen the tram service disrupted over the course of a number of months. 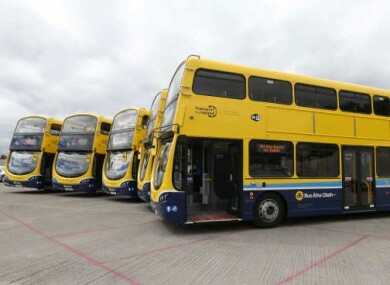 Following on from the dispute, O’Leary said the Dublin Bus workers were seeking similar terms. O’Leary said that this would amount to pay increases of about 30%. Broken down, the increases include the 18.3% in increases offered to Luas drivers, as well as 6% previously offered to bus workers workers – the rest would be made up of pay rises that had already been given to Luas workers before the dispute. “Whilst our members were enduring pay cut the tram drivers… were getting pay rises,” said O’Leary. All we’re asking for here is fair play in terms of pay and conditions. The Labour Court date comes after bus workers rejected pay rises put forward at the Workplace Relations Commission of 6% over three years. O’Leary didn’t rule out the prospect of industrial action in the future, but said that he hoped the situation could be resolved before such action was considered. “There’s a palatable anger among our members,” he said. “If they see some progress towards meeting their claim [on Thursday] that will dilute the necessity for industrial action. But of course if the opposite happens and there is no progress our people will be asking us to ballot for industrial action. In a statement to TheJournal.ie, Dublin Bus said that it was involved in an “ongoing process” with the trade union. “Dublin Bus is engaged in a process with Trade Unions with a Labour Court hearing taking place on 30 June,” the statement reads. This is an ongoing process which we will continue to engage positively in with all parties therefore we cannot provide any further information at this time. Email “Dublin Bus workers are looking for a 30% pay rise in line with Luas staff”. Feedback on “Dublin Bus workers are looking for a 30% pay rise in line with Luas staff”.